I do not expect everyone to leave Etsy for my reasons of principle and morality. I know some who have and commend them on their ideals. Etsy has changed their terms, which sadly in my eyes did nothing to change my mind. There are still cards up on the site that promote hate and intolerance. There is a card there, in the shop in question, with Jesus on a cross and it states, “What does some dead guy have to do with this holiday anyways? Merry Christmas”. WTF Really, that does not go against the ‘new’ terms!!! I will not sell there or buy from there any longer. This is just me! 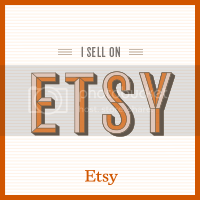 With that said, I know that there are people who rely on Etsy for income and cannot just pack up their shops and leave. I get that and am not trying to demean them or ridicule them for staying. The way the times are, some cannot afford to leave, and I DO get that. So do not demean or ridicule me for leaving. That’s all I’m saying. For me, ArtFire is less expensive [monthly fee only and no extra % on your sale] and has a better set-up. I will do my best to promote ArtFire for the amazing Artisan site it really is. Previous Post Just Say NO! WoW! !…how crass to involve Jesus in this..it makes me sick. 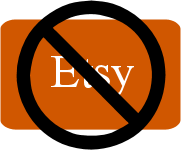 I am with you on this, no more shopping on Etsy for me. And that card is still up along with another Jesus one. I’m so done with them!! Wow! I haven’t been doing much with my Chirpings page, been so busy with every day life around the house, just haven’t been able to keep up online. I’m glad I stopped by here today, as my husband and I were just talking about me setting up an Etsy shop to sell my jewelry. I can’t participate in something where others are being offensive, hurtful, hateful or insensitive. To quietly sit in the background is to condone such behavior. Can’t do it! I guess I’ll be looking into Artfire. Considering how overly sensitive I am to name-calling, labeling, etc., soon there won’t be a place where I can participate at all, if people don’t soon start taking personal responsibility for their words and actions. UGH!! Hugs to you Tracy!! I miss ya!! !